Holden crater, 140 km across, is located in the southern highlands of Mars. 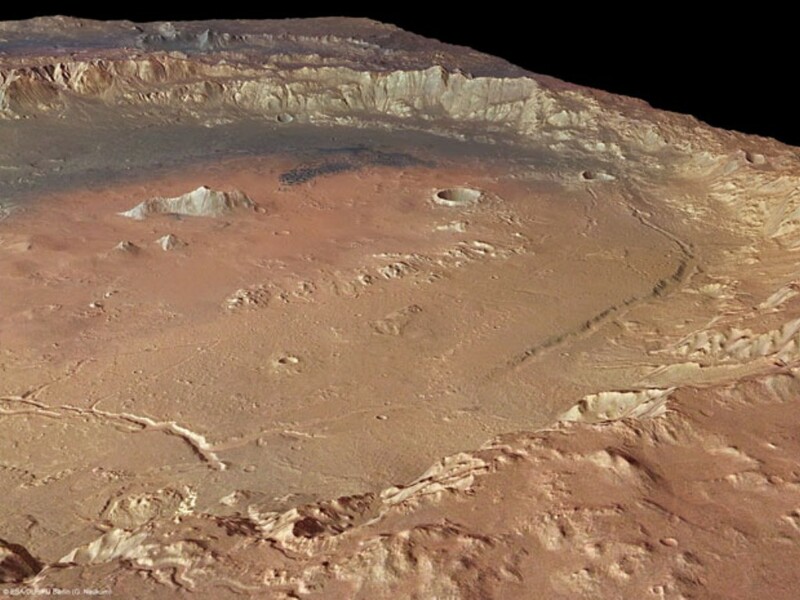 It is notable for an outlet channel, Uzboi Vallis, that runs into it, and for many features that seem to have been created by flowing water. Holden Crater is believed to have once been a lake. The crater’s rim is cut with gullies and at the end of some gullies are ancient fan-shaped deposits of dark sediments transported by water. Some of these fans are less distinct and partly covered by younger cone-shaped piles of debris from rock falls at the base of slopes. Uzboi Vallis enters Crater Holden from the south-west (in this image seen on the right, just below the middle). Astronomers distinguish two distinct phases of its development. In the first phase, a valley was formed up to 20 kilometres wide. Later, a smaller channel was cut into the valley floor. The end of the small channel has been blocked by a landslide from the crater rim. A small dune-field indicates the role of wind in the morphological evolution of Crater Holden. The terrain within Crater Holden is the result of a long and varied evolution. The numerous smaller craters inside Holden, many of which filled with sediment, indicate that the crater is old. The central mountain of Holden is partly hidden, because it has also been covered by sediments. The crater is of great interest to scientists because it has some of the best-exposed lake deposits. One of the layers has been found by the Mars Reconnaissance Orbiter to contain clays. Clays only form in the presence of water. It is believed that great amounts of water went through this area. Holden Crater was a proposed landing site for NASA’s Mars Science Laboratory, until Gale Crater was deemed a better landing site. The aim of the Mars Science Laboratory is to search for signs of ancient life. It is hoped that a later mission could then return samples from sites identified as probably containing remains of life. To safely bring the craft down, a 12 mile wide, smooth, flat circle is needed. Geologists hope to examine places where water once ponded, like sediment layers. This colour image was processed using the High Resolution Stereo Camera (HRSC) on board ESA’s Mars Express spacecraft. The image has a ground resolution of about 22 m per pixel.